You know me as a software developer and a Steem witness, but I do have another passion - creating products. Today is a special day when I get to announce something new that I've been working on for a long time! I'm proud to present 35°North — a brand which aims to become the household name for the best food products around the northern hemisphere. 35°North was born after almost a year of hard work by a team of four people and countless others who supported us along the way. Thank you! Our brand is rooted in authenticity and our love for high quality food. We work with and give back directly to local farmers, ensuring that the families which put in the hard work of producing precious food are the ones who get the most out of it. Our first product is 35°N First Edition Extra Virgin Olive Oil from Greece, grown and picked near the village of Kria, where the 35th parallel north crosses the island of Crete. 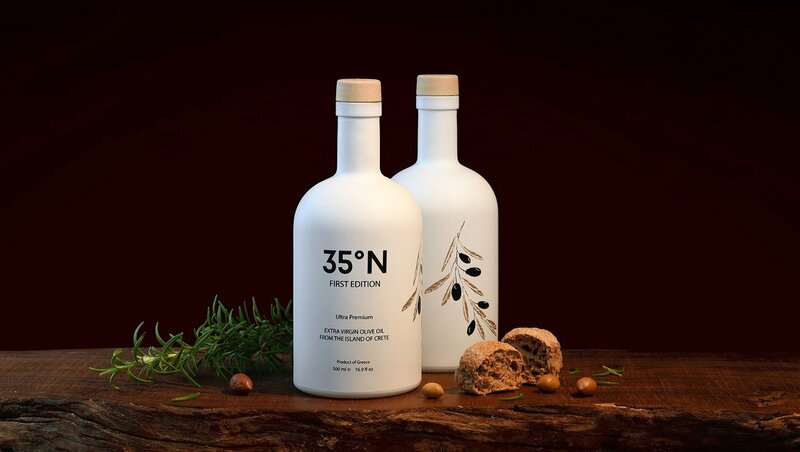 35°N First Edition comes in one size 500ml (16.9 fl oz) glass bottles, coated in matte white color to protect the olive oil from direct sunlight and to give it that pebble-like feel when holding it in your hand. The contents of the bottle are equally exciting — the olive oil was cold pressed from the world-famous Koroneiki olive variety. It results in very low acidity, fruity and smooth taste, with a tiny note of bitterness at the end. It’s the perfect companion for your culinary adventures. Only 4240 of these beauties exist and you can order yours today on our website at 35north.eu using your favorite payment methods, including Credit Card, PayPal, Bitcoin and 30+ other cryptocurrencies (STEEM integration is coming soon!). We currently ship to EU, US, Canada, Norway, Iceland, Israel, Switzerland and Japan.